This topic contains 10 replies, has 2 voices, and was last updated by Hillel Coren 2 months, 1 week ago. I’m confused in about how to create a credit nota. I have an invoice that’s only paid partly. I want to credit the unpaid part. For accounting I also need to have an official PDF to indicate the credit. 1) I created a negative invoice. The title is marked as CREDIT NOTE correctly and the amount is negative. So that’s as expected. But both the negative invoice as the partly paid invoice are now still marked as unpaid? The Credit nota doesn’t get calculated with the payed one? a) I can’t generate a PDF of it. b) If I add a credit part for the same customer, the credit is applied 2 times/double and my credit nota is still marked as unpaid? You need to mark the credit note as paid for it to affect the client’s balance. As you can see I cannot mark it as payed. This is because I tried adding payed with a negative “Apply credit” but then I removed this “payment” again. This reply was modified 2 months, 1 week ago by Laurens. Have you tried restoring the deleted payment? Yes, then I do get a credit added under credit nota’s, but negative. It sounds like you may be mixing up two separate features, credits and credit notes are not related in the app. I create an invoice for EUR 1000. 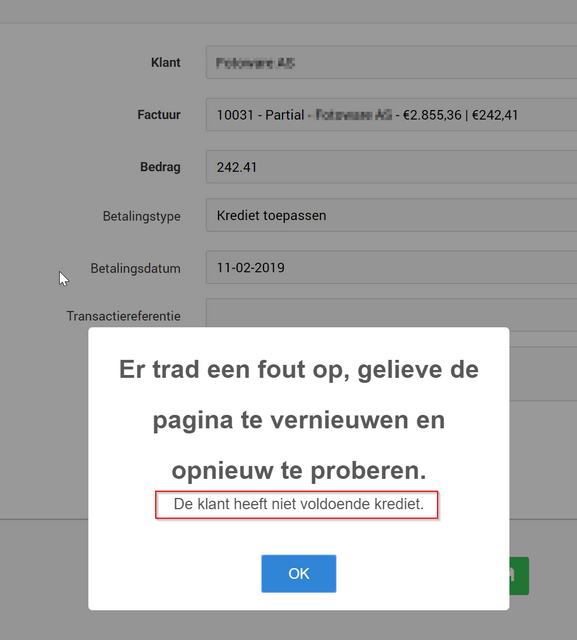 Customer cancels 50% and pays EUR 500. Invoices stays open for EUR 500 with weekly reminders being send. In Belgium I cannot edit the invoice and I need to create a credit nota so I can print and deliver this. Maybe mark the invoice as archived so no more reminders are sent. Wouldn’t it be logical if marking or even creating a credit nota (so a negative invoice) creates a credit that you can use to mark another invoice (partly) as paid? Or where do you use the credits for? Or at least if you use credit to mark a credit nota as payed, that the amount is added as a positive credit instead of a negative credit? In general credits are used by users in the US whereas users in Europe tend to use credit notes. Agreed, we’re working on redesigning this in v2 of the app.